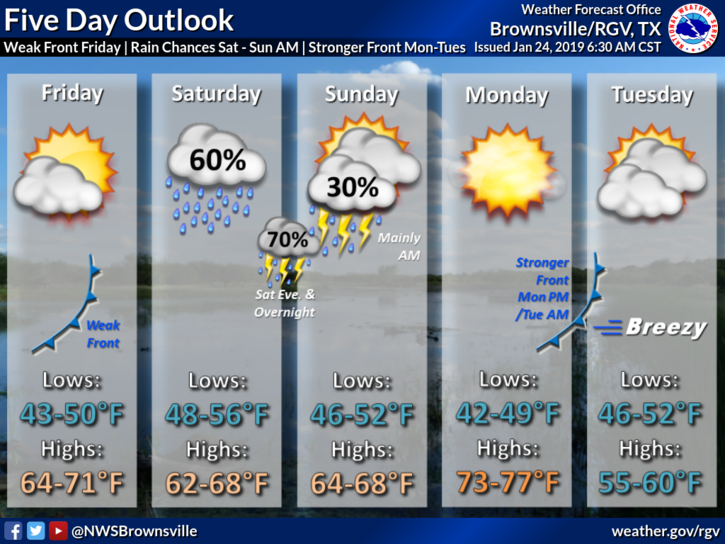 After a cold start to the morning, expect temperatures to warm up into the upper 60s or low 70s, according to the National Weather Service in Brownsville. South Padre Island will see a high of 66 while Brownsville will reach 70. McAllen’s high will be 72. Looking ahead, Fridays’ high will range between 64 and 71 degrees as a weak cold front moves in. Friday’s lows will mostly be in the 40s for the Rio Grande Valley. On Saturday, high temperatures will be in the 60s with a 60 percent chance of rain. There is also a 70 percent chance of isolated thunderstorms overnight Saturday into Sunday.